The new building for the Musée National des Beaux-Arts du Québec—the museum’s fourth building in an increasingly complex site—is a subtly ambitious addition to the city. Rather than creating an iconic imposition, it links the park and the city, bringing new coherence to the museum campus. Mimicking the topography of the hills beyond, the cascading museum extends into the park on one side, while creating an open room adjacent the city’s grand boulevard on the other. Questions relating to context underpinned the design: how to extend Parc des Champs-de-Bataille while inviting the city in? How to respect and preserve Saint-Dominique church while creating a persuasive presence on the Grande Allée? How to clarify the museum’s organization while simultaneously adding to its scale? 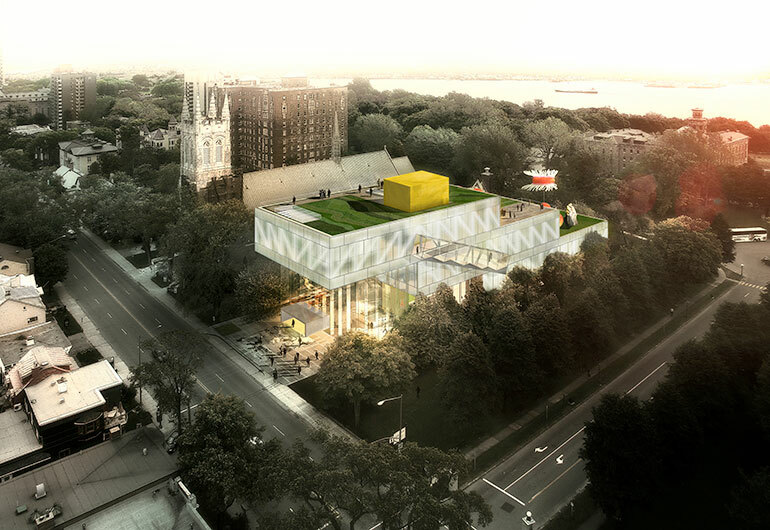 The architects’ solution was to stack the required new galleries—temporary exhibitions, permanent modern and contemporary collections, and design exhibitions and Inuit art—in three volumes of decreasing size that ascend from the park towards the city. The stacking creates a 14-metre-high Grand Hall, sheltered under a dramatic cantilever. The Grand Hall serves as a central hub: interfacing with the Grande Allée, serving as an urban plaza for the museum’s public functions, and ringed by gateways into the galleries, courtyard and auditorium. While they step down in section, the gallery boxes step out in plan, framing the existing courtyard of the church cloister and orienting the building towards the park. The staggered volumes open up sightlines from the beginning to the end of the building, juxtaposing the different volumes and their art. Within the gallery boxes, mezzanines and overlooks link the temporary and permanent exhibition spaces. On top of each gallery, green roof terraces provide space for outdoor displays and activities. Complementing the quiet reflection of the galleries, a chain of programs along the museum’s edge—foyers, lounges, shops, bridges and gardens—offer a hybrid of activities, art and public promenades. The brief for the museum emphasized the importance of natural light, but standard glazing systems were inadequate for Quebec’s winters. The solution was a translucent façade system that could provide natural light along with thermal insulation. The system uses triple-glazed panels with low-E coatings, two layers of fritting and a layer of diffuser glass. In the galleries, insulated walls are located behind the translucent galzing system, with a gap between for illuminating the building like a lantern at night. The new pavilion links to the museum’s existing buildings by a passageway rising 8.2 metres over a 55-metre length. By virtue of its length and change in elevation, the tunnel creates a string of rooms with a dramatic range of spatial and lighting conditions. Each of these serves as a gallery—a series of visually interconnected volumes that lead the visitor, as if by chance, to the rest of the museum complex. MF: What is the best way to build next to a heritage structure? This project proposes to clear out a space with a gigantic cantilever over a public gathering area. It works well in inviting the adjacent building to contribute to a common plaza. PH: The success of this project is in its sectional diagram, as a snaking form that connects through the principal public spaces and suggests links to the rest of the city. We still had questions about how the interior spaces of the building were being developed in relationship to the exterior spaces. JH: The cantilever creates an urban room, framed by trees on two sides and by the cantilever itself on top. It puts the forecourt and the glazed atrium behind it on display, and pulls you into the building. ARCHITECT TEAM OMA—Shohei Shigematsu, Jason Long, Ceren Bingol, Patrick Hobgood, Luke Willis, Rami Abou-Khalil, Richard Sharam, Tsuyoshi Nakamoto, Sandy Yum, Sara Ines Ruas, Ted Lin, Markus Von Dellingshausen, Andy Westner. Provencher_Roy—Claude Provencher, Michel Roy, Matthieu Geoffrion, Pascal Lessard, Layla Macleod, Danielle Dewar, Réal Baril, Konstantin Demin, Véronique De Bellefeuille, Fanette Montmartin.